"It takes a special type of contractor to come in, tear-off and re-roof large areas without interrupting the production below. I feel the pride your project superintendents, foremen, and crew members have in their work, can be seen in your finished projects." "The workmanship of your field personnel was of high quality."... "Your organization and responsiveness enabled all of us to achieve an excellent working relationship during construction." "Our project at UNCG consisted of a total tear-off and replacement"..."AAR completed the project thirty (30) days ahead of schedule without any rain damage to the interior of the building or inconvenience to the university." 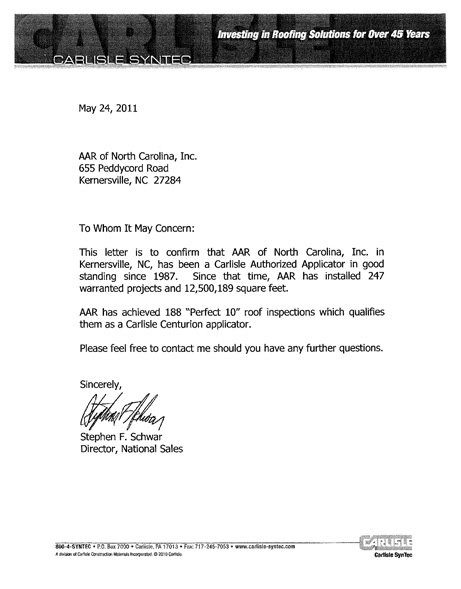 "AAR has provided their roofing ingenuity and expertise in a very timely and efficient manner"... "Due to AAR's commitment to quality workmanship and proper repair procedures, our maintenance costs have declined."